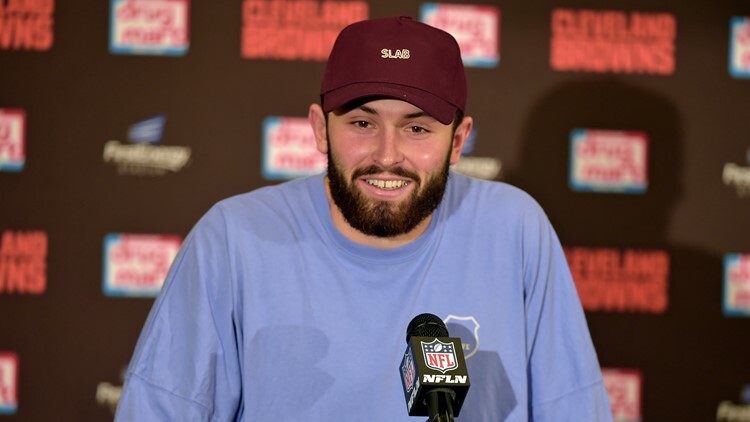 Joining Complex's Joe La Puma, Cleveland Browns quarterback Baker Mayfield when on quite the shopping spree. Over the course of his rookie season, Baker Mayfield didn't just establish himself as one of the NFL's top young quarterbacks, but one of its most stylish. And while in Atlanta for the Super Bowl two weeks ago, the Cleveland Browns signal-caller stepped up his game, starring in an episode of Complex's 'Sneaker Shopping' with Joe La Puma. On the popular web series, La Puma talks sneaker shopping habits and fashion with various athletes and celebrities, who then proceed to go on shoe-focused shopping sprees. Mayfield, who signed an endorsement deal with Nike last year, discussed the pair of LeBron James signature Nike sneakers he was gifted upon being drafted by the Browns and his hesitance to actually wear the rare kicks. "I didn't know if I could put them on and wear them around or if I'd get judged for them," Mayfield told La Puma. You can watch the entirety of Mayfield's appearance on 'Sneaker Shopping' in the video below. Following their discussion, the former No. 1 pick went on a shopping spree at the Nike SNKRS pop up shop, where he tallied a $1,187.01 bill. Among Mayfield's purchases: a pair of Nike Blazers, two colorways of the Off-White x Air Max 90s, a pair of Nike Air Skylon II X Fear of Gods, two pairs of Nike Air Max 97s and a pair of Nike React Element 87s. "I got some swag now," Mayfield said as he headed to the checkout line. Truth be told, he walked away with a little more than that.